An all-whole wheat sourdough sandwich bread with an airy, open crumb that's great not just for sandwiches but for toast or to dunk into a soup or stew. Place the sourdough starter in a bowl along with the water, sugar, and 2 cups of whole wheat flour. Mix well and let it stand overnight or about eight hours. Beat the dough the next morning with the kneading attachment of a stand mixer or with a ladle, then add salt, vinegar, and 1 more cup of flour. Continue to add the flour and mix, 1/4 cup at a time, until you get a dough that feels sticky but doesn't really stick to the sides of the bowl. Continue kneading on a flat surface, by hand or in the stand mixer, for another five minutes. If the dough sticks to the surface as you knead, add a little flour, no more than a tablespoon at a time. You want a supple, smooth ball of dough that's not too firm. Coat a large bowl with oil and place the ball of dough in it, turning over once to coat the top with oil. Cover with cling wrap or with a tight lid and let it stand in a warm place for two hours or until doubled. Lightly grease two loaf pans with an oil spray or oil, and sprinkle some cornmeal or cream of wheat on the sides and the bottom. Punch the dough down and divide into two. Shape each half into a loaf by rolling it out into a rectangle about six inches wide and nine inches long, and then rolling it into a log. Tuck the sides down and pinch any seams together. Place the loaf, seam side down, into a prepared loaf pan. Repeat for the second loaf. Cover the loaves with a towel or -- better still -- with shower caps. This is a trick I learned from the King Arthur blog, Flourish, and it works really well because it allows the loaf to expand without weighing down the top, the way a kitchen towel would. Place the loaves in a warm place and let them rise two hours or until they dome slightly over the top. 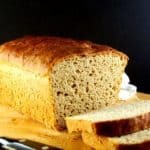 Whole wheat loaves will not dome or rise as much as white or part-whole-wheat breads will, so don't wait too long to bake in the hope that your loaf will rise further. After two hours, the bread is likely to lose its structure. About half hour before baking, preheat the oven to 425 degrees Fahrenheit. When you're ready to bake the loaves, place them on the center rack and bake 40 minutes. Remove the loaves from the oven and, carefully, turn them out onto a rack. Let them stand, right side up, until they are thoroughly cool. As attractive as the smell of freshly baked bread is, resist the temptation to cut a slice off before the bread has thoroughly cooled because you can upset the moisture balance in the loaf. I like brushing or spraying the top with a little oil for an attractive look as soon as it comes out of the oven. But no need to do this if you'd rather not.